You can download the Lite Version from the Oculus store. Most questions can be answered by checking the user manual. If this doesn’t help, please don’t hesitate to ask. Remotely manage video content on VR devices all around the world via a online CMS + get all the benefits of the EZ360 video player. 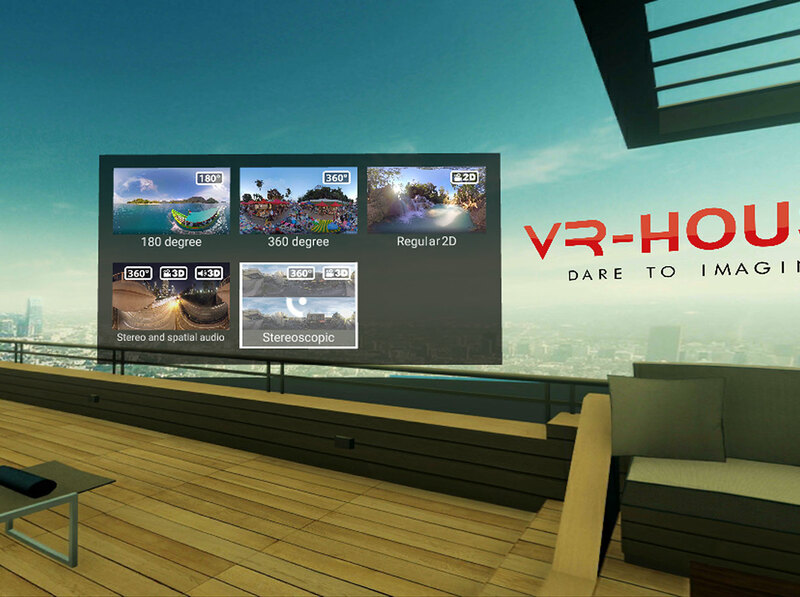 Easily distribute your videos to new VR headsets, without the need to transfer the content one headset at the time. Easily add, change or delete video content on multiple VR headsets at once. All easily managed in the cloud CMS. 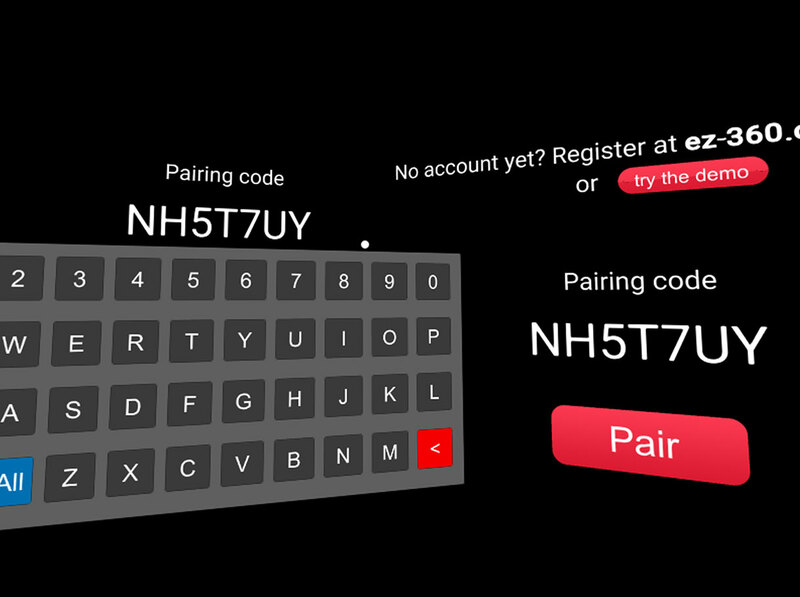 Log in just once to pair your VR headset and play your content with your own branded video player. New content will download automatically on startup of the app, this results in a fast and reliable solution to playback 360-degree videos up to 5.7K! 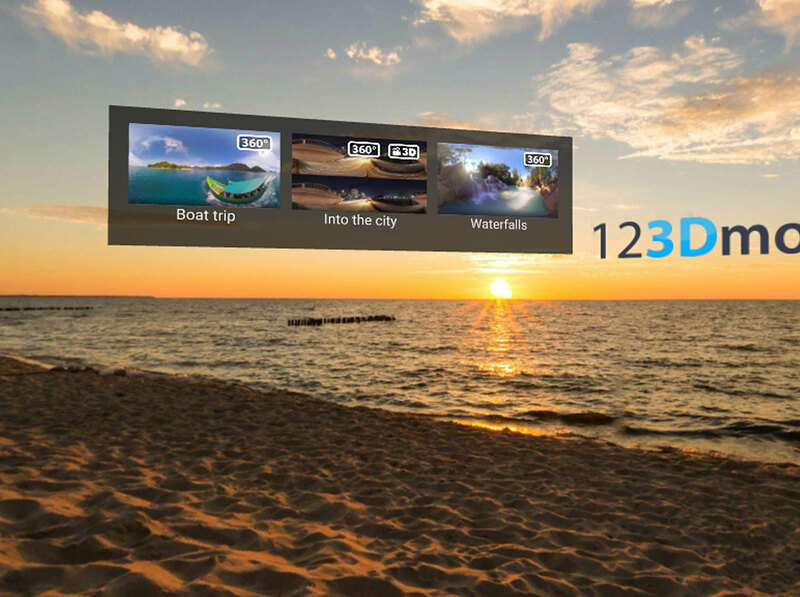 With EZ360 Cloud you can distribute 360-degree video content to VR devices via the cloud. Upload and manage your videos in the online content management system (CMS). Easily push videos to VR devices. VR headsets automatically download new videos when they start the app. No more sideloading or transferring files one headset at the time. With EZ360 Cloud you can easily distribute 360° videos all around the world. EZ360 Cloud ensures that all devices have the latest and greatest of your content! Register for free to download the app. Do you have multiple clients with different 360 degree videos that you want to manage remotely or does the company you work for have different locations with its own specific content (e.g. different languages or totally different videos)? Using our management system you can create several user accounts for which you can each manage the content individually. Your clients or colleagues can also access and change their own content, by logging in to their user account, but they don’t have access to the other accounts you manage. Video producer X is creating a 360° video for a client. To show his progress and receive feedback he uses EZ360 Cloud to push new versions to his clients VR headset. The clients’ headset automatically downloads the latest version and plays the video automatically. Share new versions of your video with your client that they can easily download and view in a VR headset. Video producer Y creates and manages videos for different clients. She also takes care that the clients’ VR devices have the latest version of the video installed. She uses the EZ360 Cloud CMS to add and update videos on the headsets of her clients. 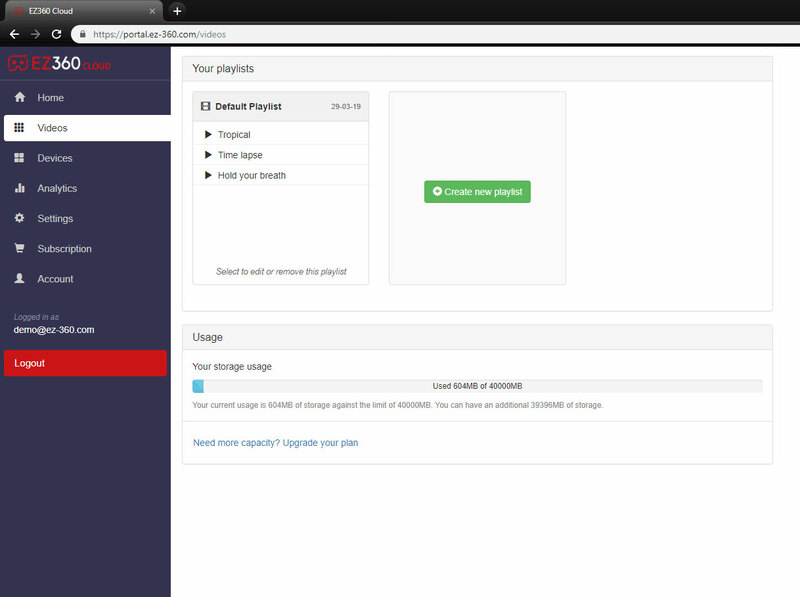 Easily add, change or delete content for different clients using the online CMS. Company Z uses a 360° promotional video worldwide. They have multiple versions, each with a local language. They use EZ360 Cloud to centrally manage all the content and when a new office joins the VR program they can easily be added to the CMS. 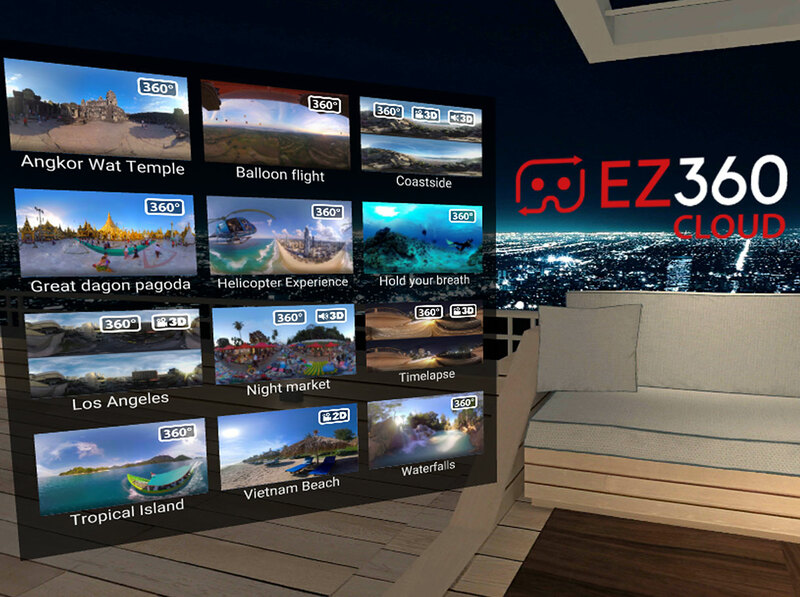 With EZ360 Cloud you can remotely manage content on VR devices that might be on the other side of the world. 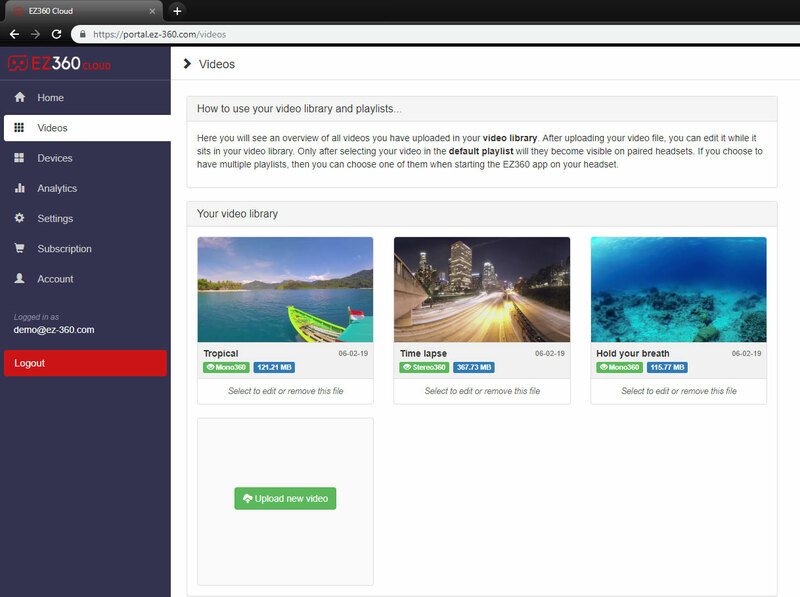 Manage your videos on any device with a browser. Once the videos are downloaded you don’t need an internet connection to play the videos. With account management, you can become an admin and manage other peoples accounts. Especially useful for video creators that have multiple clients that use EZ360. The number of times a video was viewed, the average time a video was viewed, and when the video was last viewed. The video starts automatically when someone puts on the VR-headset. No user actions required! The video resets to frame 0 when someone takes off the headset. Once someone picks up the headset the video will automatically start. Add your custom logo to the video selection screen. Upload a custom image (per video) to use as a thumbnail. 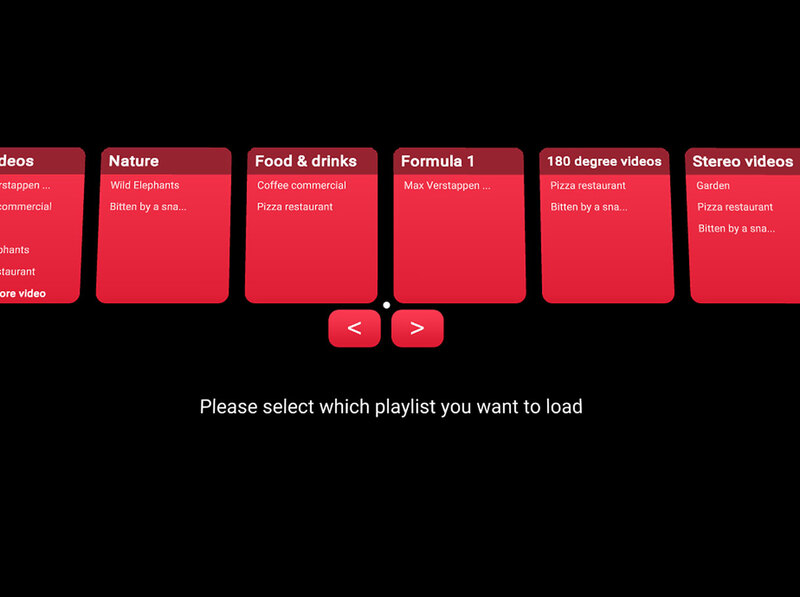 Upload a 360° image to use as the background in the video selection menu. Show an intro screen (360° image) at the beginning of every video. Support for spatial audio with .tbe files is supported. The online content management system is directly linked to the VR video player. This way, if you update your content or make playback- or design settings online, it will directly affect how it will look like when wearing the VR headset. Our cloud solution is an extension of the EZ360 video player. 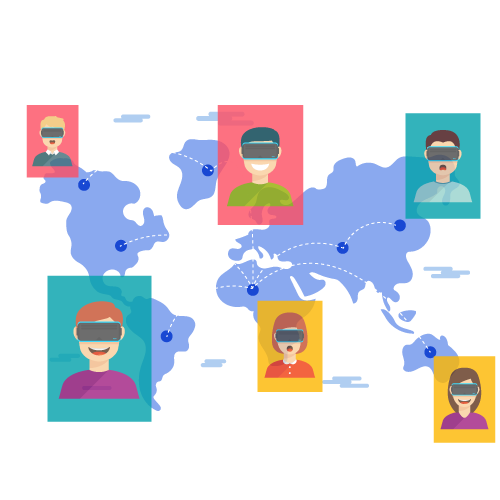 The solution is easy to use, reliable and aims to enable organizations to use 360 VR on a large scale. Join today and bring your business to the next level with 360 VR. Sorry, we're closed. Please send us an e-mail if you have any questions. Please check out our FAQ, or contact us for any EZ360 related (support) questions. We are here to help.